This is a blog all about paper, stamping and my obsession with creating cards, tags, notebooks and anything crafty! I cannot believe how long it has been since I posted last. Today is a snow day so I thought I'd play in some challenges. I haven't done this in a long time so here goes it. 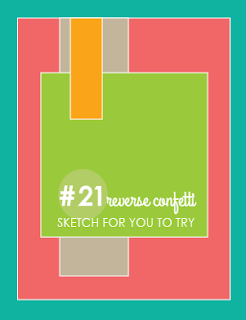 The first one I chose to enter was Reverse Confetti's new sketch For You Challenge. As you see this is a shaker card. I used Love Notes to cut my shaker and added the little submarine from Here We Go. I cut up a strip of the hearts from the Love Note as well in silver and added those to my seed beads for the shaker part. Using embossing plates from Tim Holtz, I gave the card some fun texture. What a clever and darling shaker! Love this! Great take on the SFYTT, too! LOVE your shaker! How fun! Thanks for joining us at SFYTT!